Elbert Presbyterian Church is located on a hillside overlooking the eastern plains farming and ranching town of Elbert, about 40 miles southeast of Denver, Colorado (roughly between the towns of Kiowa and Falcon). It is situated across from the bed of Kiowa Creek at an elevation of 6,723 feet. 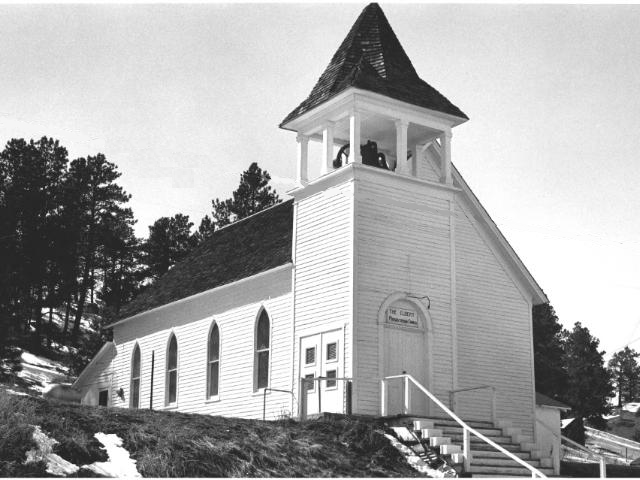 The church was the first Protestant church organized and constructed in Elbert County. In 1880, one of the early settlers of Elbert County, Jacob Frick, donated two lots on a hillside, upon which a church was to be built. In 1885, Rev. S. R. Shull from Colorado Springs canvassed nearby settlers for support in building the church. In 1889, with donations of $1500 (including $500 from the Cumberland Presbytery) and the help of some prospective members, the church was constructed under the direction of local carpenter (and Justice of the Peace) Taylor Green. At the same time, Green built the church pews, which are still in use. The original steps were built in 1899, and a lower flight of steps was added in 1948, due to erosion of the roadway in front (east) of the church. The eight beautiful and rare Gothic-style stained-glass windows (on the north and south facades) also were installed when the church was built. At first, the bell was hung in the nave, but a bell tower was quickly added, when the congregation realized that ringing the bell shook the entire building. Originally known as the Elbert Cumberland Presbyterian Church (under the control of the Cumberland Presbytery), the church was sold in the summer of 1891 and transferred to the control of the Denver Presbytery. At that time, the church was renamed the Presbyterian Church of Elbert, Colorado. Early Session minutes had the church’s membership at 62, and the members were active and influential in local politics. The church served not only as a place of worship but also as a place for social gatherings. It had a large influence on the community. In 1900, the Session appointed a committee to ensure that saloon keepers in the Town of Elbert complied with state laws regarding law and order, reflecting the church’s concern for the welfare of the community. Around Memorial Day, 1935, heavy rains caused Kiowa Creek to flood, resulting in the destruction of more than 65 buildings and serious disruption to the lives of the local population. The church, sited on a hill, was spared the flood, and its members provided shelter and care for citizens who had lost their homes or had been injured. The church also was a center for the distribution of food and clothing for other refugees of the flood. The advent of automobiles led to construction of a parking lot at the south side of the church, and the front Main Street entrance fell into disuse. A new side entrance was added for more convenient access. In 1950, a wing was added to the west side of the church, on land donated by Mr. Theodore Peterson. Friends and members of the church raised the funds for materials and constructed the addition. Today, it serves as a kitchen and gathering place. In 1975, Elbert Presbyterian Church merged with St. Mark United Presbyterian Church to become St. Mark Presbyterian Church. Because of its historic significance, the church was added to the National Register of Historic Places on September 18, 1980. Now independent from its sister Presbyterian churches at Kiowa and Elizabeth, the historic Elbert Presbyterian Church continues to serve Elbert and surrounding communities. The church has a congregation of about 40 families and opens its doors for community events, festivals, and school classes. Most importantly, the church serves as a place of fellowship and worship for those who seek the love, grace, and mercy of our Lord Jesus Christ.